On a walk around Salzburg I found this lovely path which lead me through to the fabulous Mirabell Gardens. I loved my time in Salzburg. I only had a few days there and, despite the fact that it rained during most of my stay, I found photo opportunities everywhere. In fact I'm almost certain to include Salzburg in my next visit to Europe. With luck I'II be able to extend my stay there to a week which, as well as allowing me to explore some of the surrounding countryside, should provide a range of weather and lighting conditions. And great photos are often made on the edge of weather fronts. 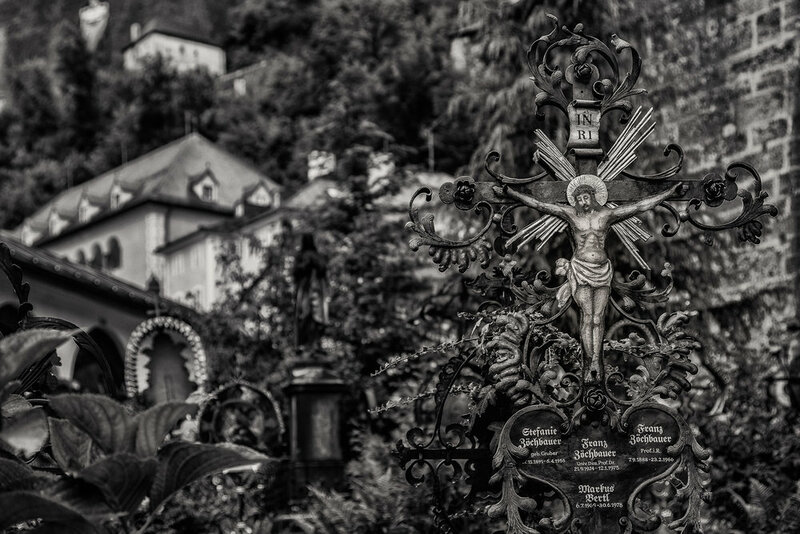 Crucifix in the grounds of the historic St. Peter's Cemetery in Salzburg, Austria. The old town of Salzburg is full of old world charm. Gardens and cobbled streets abound, as do grand churches and lovely, picturesque cemeteries. While it rained during my stay I certainly didn't let that stop me from making photos. In fact wet surfaces glow with vibrant color once the sun shines through. This is one of the reasons why photographing on the edges of bad weather often provides the most amazing light. A statue spouting water in an incredibly tranquil park in Salzburg, Austria. The photo above features an architectural foreground element, on the edge of a pool of water, backed by trees in one of the cities major public parks. You'll notice how the statue balances nicely with the building high up on the hill overlooking the park. This provides a strong link between the foreground and background with the trees adding texture and color through the mid ground. So, while the scene itself is attractive, an understanding of composition can really add a level of appreciation to the way we view images. And that's just as important for the viewer as it is for the photographer. But neither the photographer nor the viewer has to understand all the elements of composition for them to work. Composition can be appreciated on an intuitive level. If it’s there it will work. My view is embrace it and, if you have the opportunity, learn about it. But don’t let the search for such knowledge get in the way of your initial experience when viewing the image. Most important of all is to enjoy what it is you see and what you do.